'Amrutha Kalasam' is a Prasadam offered to 'Sri Garudan' to seek His blessings. It is a special offering to 'Garuthman', popular in 'Tirukkannamangai' and almost all 'Garudaazhwar' in Perumal temples. 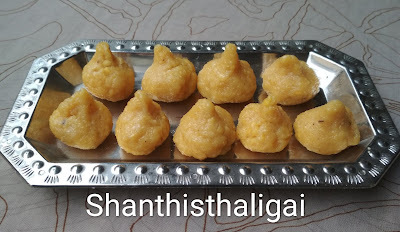 During Aadi month Swathi star which is Garudan's avathara day, this delicacy is prepared and after offering the same to Him, it is consumed as His prasadam. In 'Tirukkannamangai Bakthavatsala Perumal' temple, people worship 'Garudan' and offer 9 yards saree with checks and 'Amritha kalasam Prasadam' and seek His blessings. 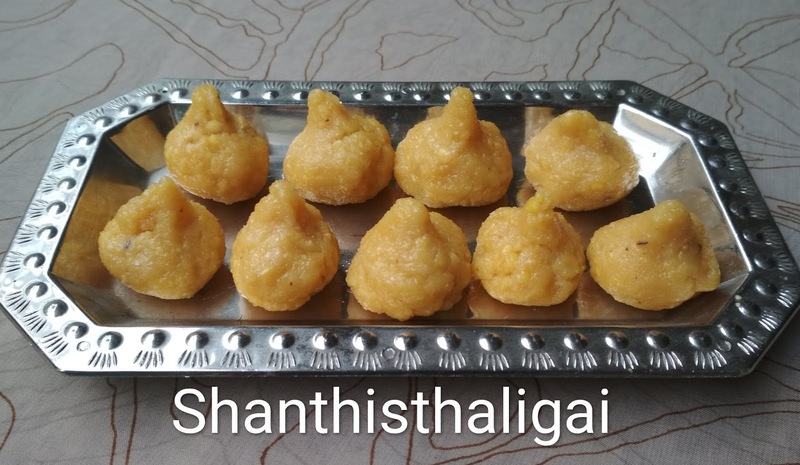 It is a belief that offering it to Him and consuming them as His Prasadam will get rid of Naga dosha, insect bites, skin problems, and also to get rid of fear. It is believed that childless couple will be blessed with children, also men and women whose marriages are getting delayed due to various reasons, will soon get married . 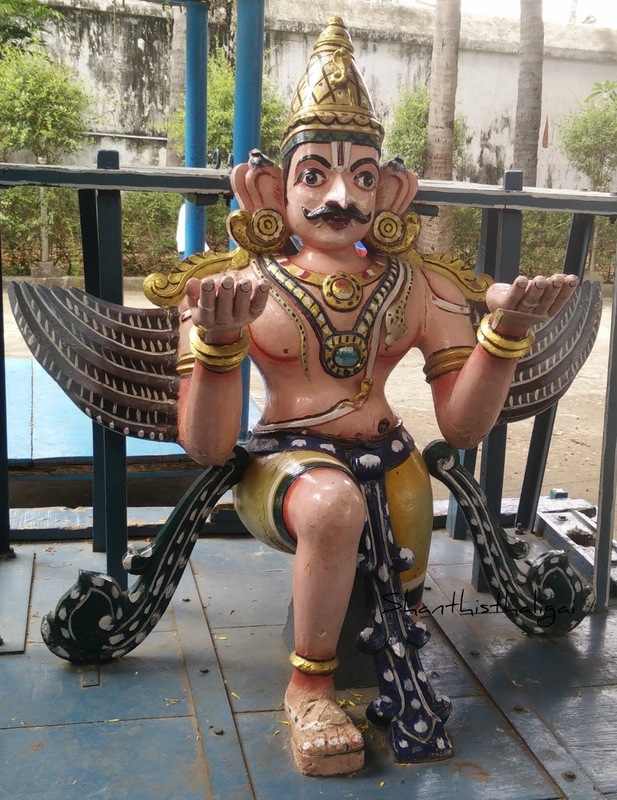 This offering is made on all Thursdays,Sundays, Swathi stars and also on Aadi Swathi, the star of Garuda. 'Prasadam' is the food that is offered to God. It is the practice of Hindus to offer food to God before eating it. Everything you offer on your altar becomes prasadam, the grace of the God, and is called by various names Prasadam, Bhog and Naivedhyam. The offerings can be fruits, sweets, bakshanams or anything but doing it with love and devotion is important. Bhagavath Geetha says, “Krishna accepts the offering made to Him with love”. 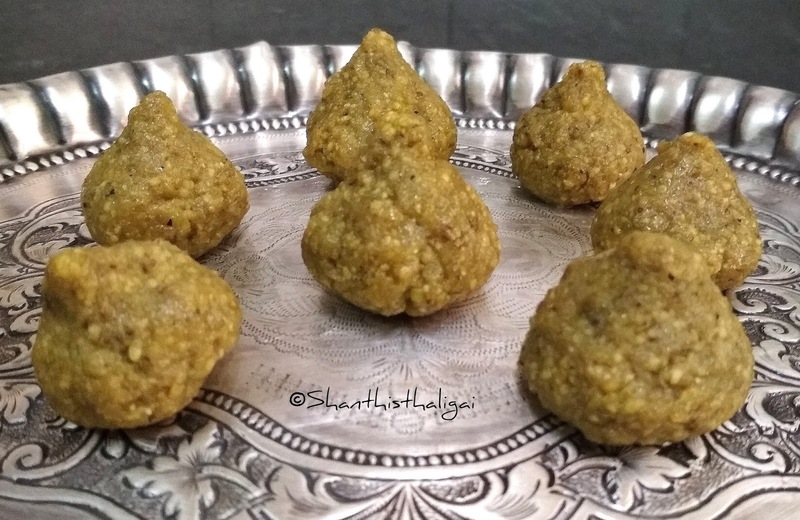 In Iyengar households, whatever we cook is offered to 'The Supreme Lord Narayana' and it is termed as 'Kandarula pannuthal'. Soak dhal for 2 hours. Drain water and grind to a coarse paste. 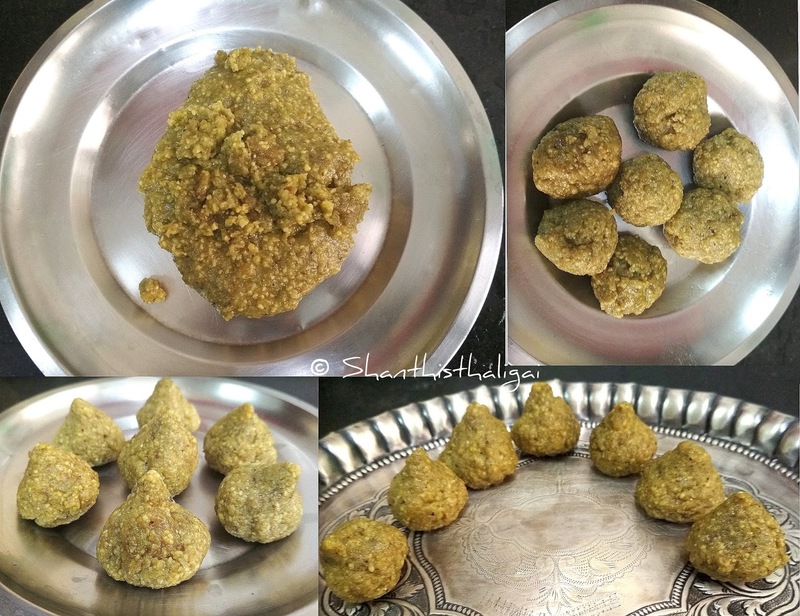 Dissolve jaggery in little water and filter to remove impurities. Heat a kadai, pour in the dissolved jaggery and allow it to boil until it diffuses its raw smell. Now add scraped coconut, cardamom powder and ground dhal and mix well without any lumps. Add ghee and saute until it binds together. 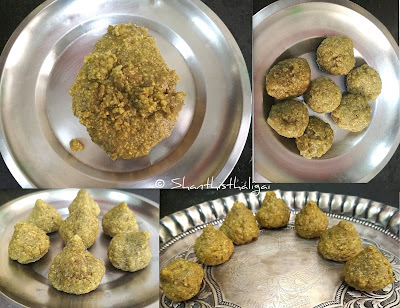 When warm, make small balls and shape like 'kalasam' (coconut/modakam shape). Arrange them in idli plate and steam cook for 7 to 8 minutes. Amirtha Kalasam is ready for offering to Garudaazhwar. It is very new to me ! Healthy also !! For outer cover no rice flour or wheat flour ?? No outer cover and no rice flour. Just make it with the dough.